Startseite /Kontakt /Krieger, Gerhard, Prof. Dr.-Ing. Gerhard Krieger received the Dipl.-Ing. (M.S.) and Dr.-Ing. (Ph.D.) degrees in electrical and communication engineering from the Technical University of Munich, Germany, in 1992 and 1999, respectively. From 1992 to 1999, he was with the Ludwig Maximilians University, Munich, where he conducted multidisciplinary research on neuronal modeling and nonlinear information processing in biological and technical vision systems. Since 1999, he has been with the Microwaves and Radar Institute of the German Aerospace Center (DLR), Oberpfaffenhofen, Germany, where he started as a research associate developing signal processing algorithms for a novel forward-looking radar system employing digital beamforming on receive. From 2001 to 2007, he led the New SAR Missions Group which pioneered the development of advanced bistatic and multistatic radar systems, such as the spacborne SAR interferometer TanDEM-X, as well as innovative multichannel radar techniques and algorithms for high-resolution wide-swath SAR imaging. Since 2008, he has been the Head of the Radar Concepts Department which hosts about 40 scientists and research engineers focusing on new SAR techniques, missions and applications. In March 2019, Gerhard Krieger became also a Professor at the Friedrich-Alexander-University Erlangen, Germany, in the frame of a joint appointment with DLR based on the Jülich model. Gerhard Krieger has been serving as Systems Engineer for TanDEM‑X and he contributed to the design and development of several further radar systems and missions with a number of key innovations. An example is the cutting-edge radar observatory Tandem-L, where he led from 2008 to 2016 the Phase-0 and Phase-A studies conducted in international partnerships with NASA and JAXA, and where he is currently heading the mission and performance engineering activities. Besides these major space projects, his research focuses on new concepts for radar systems, missions and applications, with an emphasis on disruptive SAR imaging techniques and technologies employing bi- and multistatic satellite formations, digital beamforming, MIMO SAR and cognitive radar. The research in these areas led to more than 90 peer-reviewed journal papers, about 400 conference papers, 9 invited book chapters, and 25 granted patents, 15 of which a priority establishing. Gerhard Krieger is a Fellow of IEEE and received several national and international awards, including the W.R.G. Baker Prize Paper Award from the IEEE Board of Directors in 2012, two Transactions Prize Paper Awards of the IEEE Geoscience and Remote Sensing Society in 2008 and 2015, and two Best Paper Awards at the European Conference on Synthetic Aperture Radar in 2016 and 2018. He is also co-author of two IEEE Geoscience and Remote Sensing Letters Prize Paper Awards in 2015 and 2017, and in 2012 he and his colleagues were nominated for the German President’s Federal Award for Innovation and Technology. In 2014, he served as the Technical Program Chair for the European Conference on Synthetic Aperture Radar and as a Guest Editor for the IEEE Journal of Selected Topics in Applied Earth Observations and Remote Sensing. 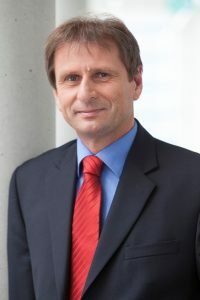 Since 2012, Gerhard Krieger has been Associate Editor of the IEEE Transactions on Geoscience and Remote Sensing.